This asset will allow you to generate few different shapes you may need in your project and modify them in inspector or through your code. Simply drag the Shaper2D prefab onto your scene and use the sliders in inspector panel to change the mesh to desired shape: circle, star, polygon, sector or an arc. You can change those values in your code to achieve animations. Check out my other assets! 2017-01-29 - Optimized it a lot. Now it produces zero garbage. 2017-02-23 - Wow, so many people downloaded this script in last few days! I guess it's useful after all. And thanks a lot to those who payed for it! This means a lot to me and encourages me to keep working on things like this. 2017-04-12 - I've published a newer version of this asset on Unity's Asset Store. 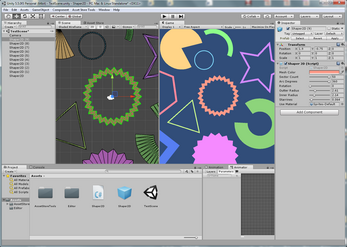 Main differences are: it has a circular gradient (between inner color and outer color), it draws mesh using MeshRenderer component instead of DrawMesh function so it now fully conforms to Transform (scaling, rotation, etc), it can be drawn inside of a UI Canvas hierarchy if you place it there. Also now it's not a prefab, but an item in objects menu.